Movavi ChiliBurner is the complete burning solution. Create, copy and backup Blu-ray, DVD and CD, with the option to burn video to DVD video or convert to VOB. Create CDs and DVDs with data, video or audio content. Create DVDs, VCDs, SVCDs in all popular video formats: Windows AVI (*. 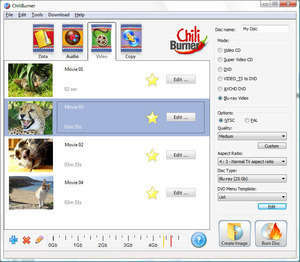 ChiliBurner 3.3 is a shareware program and can be used as a demo to try the software until the free trial period has ended. A full version of the program is available after the trial period ends. For security reasons, you should also check out the ChiliBurner download at LO4D.com which includes virus and malware tests. Additional screenshots of this application download may be available, too. ChiliBurner download been highly rated by our users.